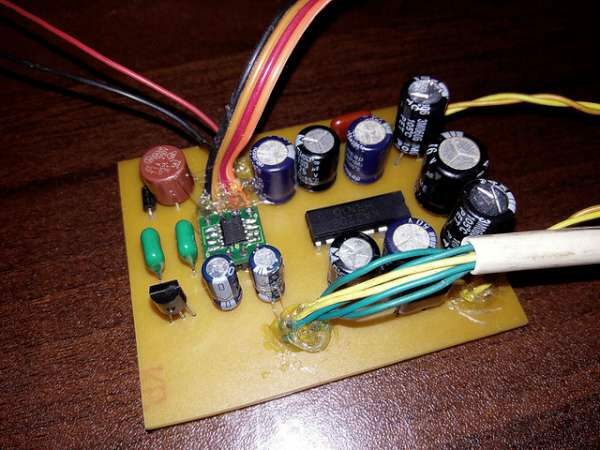 In this project we build simple I2S stereo decoder with amplifier. To decode I2S data we use Princeton Technologies PT8211 16bit DAC. KA2206 audio power amplifier is used as driver stage of this system. Structure of this I2S amplifier is self-explanatory from the schematic. We select PT8211 and KA2206 combination due to lower cost and availability. Unfortunately PT8211 DIP package is not available in local market and we use SO package in our prototype. We design PCB for the DIP packages, and therefore we solder PT8211 SO package to PCB using “SO8 to DIP8” converter. This entry was posted on Friday, February 1st, 2019 at 4:08 pm	and is filed under DIY. You can follow any responses to this entry through the RSS 2.0 feed. You can skip to the end and leave a response. Pinging is currently not allowed.